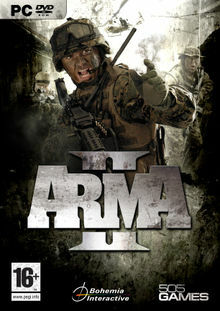 Arma 2 is a military simulation game for PC DVD-ROM and digital download from Bohemia Interactive. Arma 2 is set in the present day, in a fictional post soviet country called Chernarus. Players will be sent as members of a United States Marine Corps Force Recon squad to this country to prevent further civilian casualties and ensure ongoing stability there. Arma 2 is based on the latest generation technology, offering large–scale game world, authentic and extremely detailed modern units, weapons, vehicles and environments, challenging single player and vast array of multiplayer options. Arma 2 is Game 2. Main characters (Team Razor) of the new campaign named "Harvest Red"
This page was last edited on 29 April 2015, at 04:34.